"Mondel Brodt is a semi-sweet cookie/bread much like biscotti. A delicious Jewish treat. Great with coffee or tea." In a large bowl, whip eggs and sugar until light. Mix in the orange extract and oil. Combine the flour and baking powder; stir into the egg mixture along with the walnuts. Form dough into 4 logs and place them 3 inches apart onto an ungreased cookie sheet; flatten slightly. Bake in the preheated oven for 20 to 25 minutes, or until golden and firm to the touch. Remove from the oven and cool completely. Remove to a cutting board and slice each log into 1 inch wide diagonal slices with a serrated knife. Return the slices to the baking sheet, cut side down. Return the slices to the oven and bake for an additional 5 to 10 minutes, until toasted. This is a good recipe but a bit bland. Next time I would add orange zest. 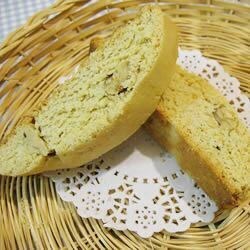 Very good Biscotti. I didn't have orange extract so used 1 tsp almond and 1 tsp vanilla. I added 1/2 C choco chips. Good for dunking in coffee or hot chocolate. Alone they are not that great. If I were to make them again, I would use a different type of nut (pecans) and add some dried fruit or chocolate.